This category is for any post that is promoted to the top of the main page. This works best when one contributes a link to a photo in the ‘Image’, ‘Thumbnail’ and ‘Preview’ custom settings when posting. These images will be resized automagically. New year, new possibilities, probably the overriding theme for this year’s Lugi Ladies as they arrived to Växjö to take part in Håckes Cup. As a coach, this was likely the most excited and nervous I have been as we start the year, excitement due to a travelling squad of 17 (down from 18 after a last minute injury), a squad which was without a few of our well known big performers, but nervous as we were coming in as a unknown quantity. 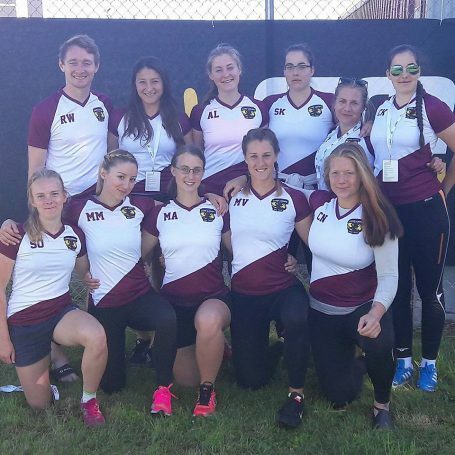 The squad included eight players that had either never played a 7s game before or were attending their first 7s tournament, and with these additions having only every trained a few months of rugby, there was bound to be a lot of growing done both on and off the pitch. The draw for the tournament was not exactly kind to us as our first two games were against the previous year finalists and this year’s favourites, Polish Ladies and Tabusoro Angels, but despite this there was a great focus within the group to go out and learn against some of the best. With Polish Ladies being our first test, the aim was to set some standards for the year in both our attacking and defensive play. The biggest positive from the first half was that our defensive pressure forced our well skilled opposition into multiple mistakes, as down to a lady we were up and in their faces after every breakdown. Being down by only three trys at half time was an achievement in and of itself in hindsight, but the oppositions quality, fitness and speed shone through as the ladies went down 45-0. As we turned around to game two, we were met with some familiar faces in our Tabusoro friends, this year having brought a very physical outfit to play. This time we ended up being on the back foot from the beginning and hardly having any ball to play with, eventually creating another lopsided score and a loss of 43-0. Despite having recorded two losses and no trys in our favour, the ladies maintained their focus and energy going into what was realistically the most important game of day 1 against Gothenburg, again another side that had a big size advantage on us. Whilst Gothenburg exerted a lot of pressure through their rumbling attack the ladies were steadfast in defence with heroic efforts from all, lead particularly by Madita Olvermann and Josefin Dynefors, not allowing the oppositions pressure to turn into points. An early score from Malin Lindström gave us a 5-0 lead from an scrum on halfway, but the lead was soon nullified by Gothenburg at the end of the half to leave us tied at 5-5. Despite the opposition putting us under early pressure to start the second stanza, a turnover on our own 22, some nice offloading and a lovely 70m finish from captain fantastic Sandra Olofsson saw us take a 10-5 lead. From this point we looked in control, going close on a couple of occasions but not being able to finish with scores, leaving us in a precarious situation, and one which could have easily seen Gothenburg sneak a try and the win. However as they attacked in our 22 and with 2 Lugis down injured our girls once again secured a turnover and moved the ball to space and into the hands of our flying Dutchman Katinka den Nijs who promptly went on the longest run of her life and finished the game off with a try to seal our 15-5 win. To finish off day 1 we faced off against Södertälje. This game gave us the opportunity to start our two youngest Lugi debutants, Linn and Lina (both 16), and get to see what they were made off. It took mere seconds to find out that they had instantly become a part of the Lugi family and were ready to give the team their all; following a Södertälje line break that looked destined to see our girls go a try down, Linn produced a fantastic covering effort to drag down the attacker with mere meters to go to the line, followed up only a few phases later as she made a great step and line break before going 60m+ for our opening try. From there the young Lionesses found their rhythm, managing to increase their lead just before the half with a Damien McKenzie-esque effort from Josefin. The second half went much the way of the first with Lugi pressure forcing opposition mistakes before eventually a break from a scrum lead to space opening for Lina this time who took the opportunity with glee for her first try and a Lugi lead of 17-0. With that score we introduced another debutant into the game as Astrid Martinsson took the field, immediately making her presence felt with a barnstorming run down the wing and a sublime offload to almost see Amelie over in the corner before the move was eventually finished off with another Josefin try. As if the game hadn’t gone well enough, our football convert Freja Franzen quickly showed off the power of her crossover skills by dribbling around the Tälje defence, eventually creating an opening in the middle of the park for Linn to go over for her second try on debut. The game finished up in similar fashion to how it started as our opposition made a break down the wing only to be denied by a fine Josefin covering tackle (ok she did get yellowed as it was high), but the tackle showed the work ethic of the team willing to protect their try line even when the game was dead and buried. All in all, a fantastic game for our new crop of Lionesses and a good win to finish the day. Our 3rd place finish in the group saw us through to the plate semi-final with a midday kickoff against Ronneby. The girls were on the front foot early on and having worked themselves into Ronneby’s 22 were gifted with a penalty 10m from the line which Sandra Olofsson soon converted into points with a quick tap and score. Once again, the team exerted a lot of defensive pressure, with Freja proving to be a constant disruption to Ronneby’s attacking play and never allowing them to gain any real foothold in the match. Sandra was once again the beneficiary off a quick turnover from Linnea Roslund this time as she cruised in from beyond halfway to make the half time score 12-0. The second half saw the introduction of a lot of our newer players and the game became slightly more attritional as Ronneby had long spells of possession but were never able to break our line. The game was finished off in a sublime fashion as Lisa Rämisch initiated another turnover try from outside our own 22 which saw her deliver the ball to Lina who preceded to round her defender and make for the try line before being dragged down and executing a beautiful lift off the floor to the supporting Lisa to go in under the posts. Game done and onto the plate final where we would meet Gothenburg. A look into the ladies half time huddle! The last game of a great weekend for the team and the focus was firmly on controlling what we could control and letting the rest take care of itself. Once again Gothenburg rumbled forward at first receiver trying to bulldoze our line and once again our defence held up, with every single Lioness making several key tackles each. With Gothenburg going closest to the first try of the game it looked like their physicality would break us down, but having defended a 5m scrum and earning ourselves a penalty our girls shifted the ball wide into the hands of Malin Lindström who went on another impressive 90m canter, rounding the sweeper and putting us into 7-0 lead. Gothenburg once again took charge of the play following the kick off, but with our defence in their faces they let a ball slip to the floor and Lindström once again went down the wing for the score, 12-0 at the half. The half time team chat asked for more of the same, keep tackling and keep it out of the contact. Unfortunately mistakes and ill-discipline allowed Gothenburg to spend the entire half in our territory and once they had their all the ball and we were unable to wrestle it from them. This pressure eventually lead to the classic, yet effective, schoolboy tactic of giving it to the biggest runner from a 5m penalty and with only a couple of minutes played in the second period our opposition were within a score of us again. With Gothenburg winning a scrum just within our half following the kick off, the penalty count started to mount, and the resulting yellow card saw us down to 6 and defending our line. 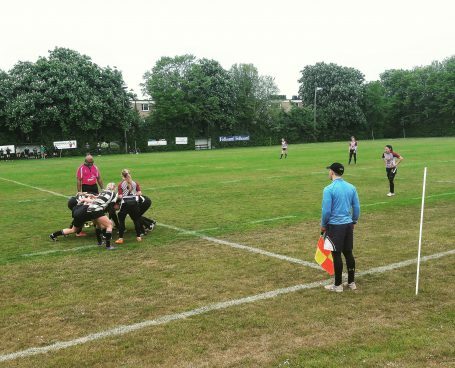 This eventually resulted in another Gothenburg try, this time directly under the posts and with the ensuing conversion, the game was tied at 12-12 and going to extra time. By this point the physicality of the game had already seen us lose both Madita and Erika to injury and it was a big ask to play further minutes against an opposition that had all the momentum. Despite that, we came mere meters from winning as a loose Gothenburg kick saw Malin once again hare down the wing looking for the finish only to be forced out 5m from the line. Unfortunately, that tackle was both the end of Malin’s game and the game itself as from the resulting lineout Gothenburg swung the ball wide for the first time in the game and produced their own 90m effort to take home the spoils. Whilst the way the tournament ended was a disappointment for the team, the positives we took out of the weekend far outweigh any kind of cup win. All our new girls got to play and enjoyed their rugby, the team created a fantastic atmosphere despite being a very new constellation and most importantly they enjoyed the rugby they played together, a great sign for the upcoming season. 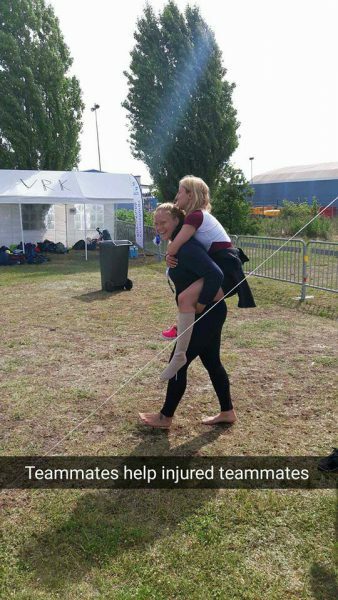 FInally I would just like to give a big thanks to the weekends support team of our two managers Martina and Rebecka as well as our physio Elizabeth who all played massive roles in the weekend’s success! The Ladies would like to thank our kit supplier Nordic Rugby for the amazing warm up tops! This entry was posted in Match Report, News, Women's Team and tagged håckes, lionesses, Lugi, lund, rugby, sevens on March 14, 2019 by Lisa. 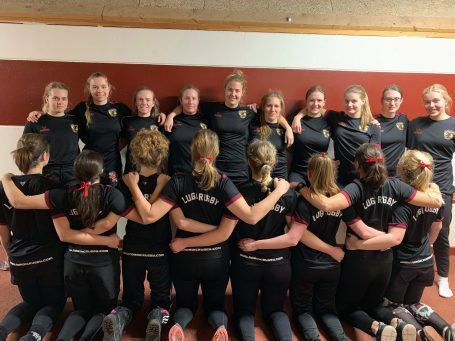 Following the ladies successfully SM qualification campaign in which a third place finish in the Southern group qualified them for group B of the SM finals, our girls were in Norrköping last weekend to compete for the top spots in Swedish 7s rugby. Our group pitted us against local rivals Malmö as well as Vänersborg from the West and Stockholm Exiles from the northern group, a tough group with the team having a relatively mixed history in terms of past results against each of their opponents. For this group of Lugi Ladies, it was their first SM as a unit and was always seen as a building block towards future competitions. Ross Watson (coach), Elizabeth Sonnenholzner, Agnes Lindgren, Sara Kaminski, Linnéa Roslund, Cecile Kaminski. Sandra Olofsson, Meliha Mehmeti, Malin Andersson, Martina Vivlund, Cornelia Norén. 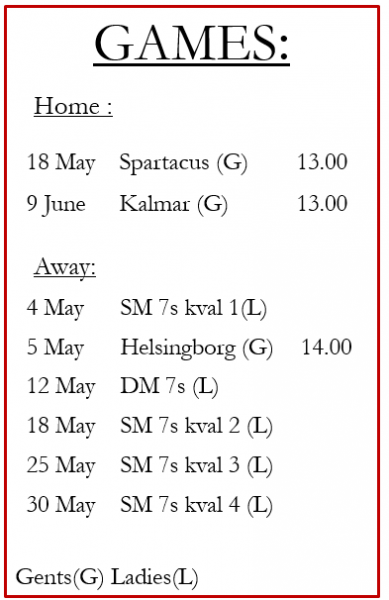 The Saturday opened with the girls taking on eventual finalists Vänersborg in the blazing heat of midday, in what was considered to be one of our winnable matches. Unfortunately, it appeared that nerves and the opposition got the better of the girls as any semblance of the gameplay appeared to be thrown out of the window from the kickoff and the ensuing battles at the breakdown were inevitably won by the more physical Vänersborg team. Lugi hung tough despite the early scores by the opposition, but with a lack of execution in attack or pressure in defence Vänersborg eventually ran out as comfortable winners 20-5. 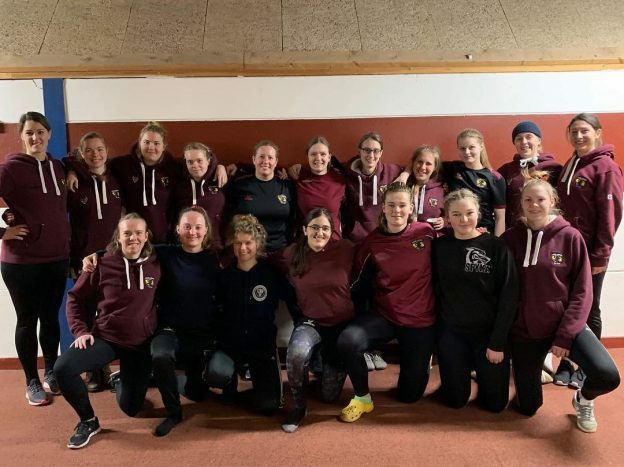 Following the disappointment of the first game, the team took on group favourites Stockholm Exiles who, despite having numerous girls away on national duty, were still very strong, physical outfit. Despite the relatively short rest between the games, our girls came out and put in a much stronger performance, creating some good opportunities to take command of the game in the first half. Despite these chances it was Exiles who took a 10-0 lead following Lugi mistakes at the lineout and defensively from a penalty. The girls would finish the first half strongly after a sustained period of pressure and nifty handling work saw Agnes go over to leave the half time score at 10-5. However, the second half saw the Exiles step it up a gear, controlling the ball well and never letting our girls find the rhythm they had built at the end of the first half, putting a further three trys past us to take the final score to 25-5. With the prospects of making the cup semi-finals very slim, the girls went into the Saturday’s final game against Malmö with nothing to lose, and motivated by a chance to get one over on our rivals who had beaten Vänersborg 12-7 earlier in the day. The game our ladies produced was light years apart from what they had displayed earlier in the day, executing the game plan well and working so hard that we blew the opposition off the pitch. For a team that we’ve had back and forth battles against all year, to beat them so comfortably really proved to the team what was possible if they executed what had been worked on in training. First half trys came from Meliha, Martina and Sandra, with Meliha crossing over for one more in the second half. Whilst Malmö scored one on the very last play of the game, it was merely a small blip on the dominance of the Lugi performance for all 14 minutes. 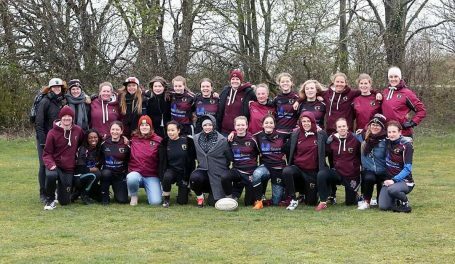 With a win in the last game, the girls finished third in the group behind surprise group winners Vänersborg and Exiles in second, setting us up for a plate semi-final against the bottom of group A, Kalmar. The fortune of coming third on the Saturday, meant a slightly later kick off for our ladies against a Kalmar team that had struggled with numbers on the Saturday, but had been bolstered by some late reinforcements come Sunday morning. The big positive for our girls was that they started exactly how they had finished the previous day, controlling play for large periods of the first half with plenty of defensive and attacking pressure. First half trys came from Martina spotting a game following a lineout and and a opportunist Meliha displaying her footballing skills following some Kalmar handling errors. The second half started much like the first, with an early try coming from Martina following a quickly taken penalty. From there however, Lugi’s luck began to turn. Firstly an error on our kick off lead to Kalmar securing a quick score and pulling the game back to 19-7 before tragically, a tackle ended Meliha’s weekend in a broken leg mere minutes later. 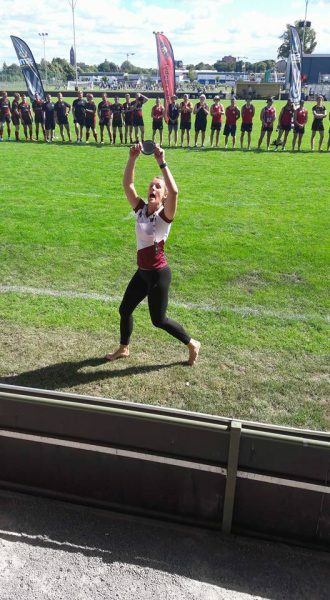 This was naturally a low moment of the weekend as the team lost one of the girls that had really stepped up and shined, something that became apparent when she picked up both the players’ player and coaches’ player award. Fortunately Meliha is ok and should heal quickly. The rest of the game became a very nervy affair for the ladies as Kalmar really started to gain some self-belief and began to control the second half’s proceedings. When they pulled the score back to 19-12 with around minute left on the clock, the game looked like it had a chance to going to extra time with the way Kalmar had been playing, fortunately however, the refs whistle drew an end to proceedings before the girls in blue could add any more scores. With the win, the ladies earned themselves a long rest and a spot in the plate semi-final against the old foe Malmö. Note: No footage of the final game due to our cameraman helping Meliha at the hospital. The last game our the 7s year would see us having a chance of silverware in the plate final against Malmö, a team that we had managed to handle easily the day before, but one that everyone knew would come out firing after the smarting they had received in our group match. The message to the team before they ran out was to dig deep and push themselves past wall they would eventually hit after four intense games of 7s. On this front they delivered with aplomb. Once again, the execution of the game plan and the high work rate proved far too much for Malmö, with our defensive pressure forcing them into mistakes and our width in attacking making them work very hard to defend us. First half trys were scores by Elizabeth and Martina put us into the driving seat, and once the team had established themselves, they never looked like relenting having taken the lesson from our previous game against Kalmar. Whilst Malmö fought hard, they were unable to constantly threaten with the ball, only scoring once with a few minutes to go, whilst Lugi managed to go over twice more in the second through Sandra and Martina. 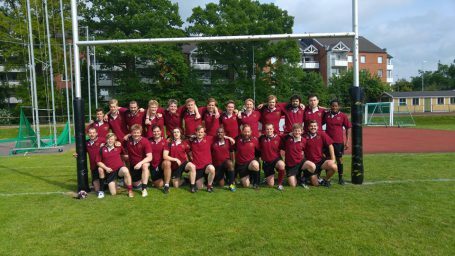 Final score Lugi 24 – 5 Malmö and a plate coming home to Lund! This entry was posted in Match Report, News, Women's Team and tagged Lugi, lund, rugby, rugby7s, SM, SM veckan, world rugby on July 13, 2016 by Ross.